Full Face Glossy Laser Labels for CD, DVD or Blu-ray discs. Laser Photo Quality Glossy High Resolution. Label size is 4 11/16" round with a 5/8" center hole. Two disc labels per 8 1/2" x 11" sheet. These photo quality DVD CD Blu-ray labels work great with color laser printers. See template page for free templates. Need great, powerful, free, software to create your disc labels and CD, DVD, or Blu-ray case inserts with? 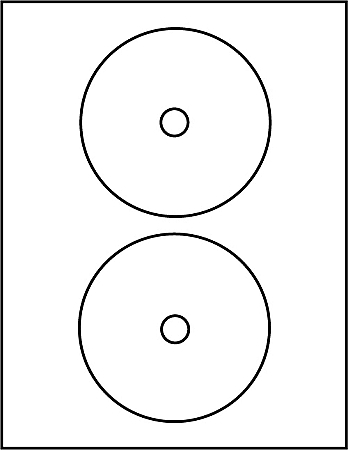 with this free Open Office Draw template for our 4060 series disc labels.